Quite a bean if I say so myself. This 18th century Netherlands heirloom has never been manipulated, so the bean you grow in your garden is the same as the original cultivar. They are versatile, use them as a snap bean, or as a dry bean. I chose to let them dry on the plant, and I'm glad I did. I made a pot of soup today with the dry beans, and for me, they are the best tasting beans I've ever had. Slightly sweet and nutty with a creamy texture, they had a unique flavor that transcends any bean flavor I've ever had. I like beans, so I've sample a good number of varieties. I did sample a few fresh off the plant in the garden, and they weren't much different from a fresh string bean. In my experience, they are a bean well worth drying. The plants are compact and I was quite satisfied with the yield. I'm glad I didn't plan my garden before I had the soup. I might have overlooked these tasty morsels. They will be my bean of choice until further notice. Sorry, I don't have a photo for this heirloom variety yet. You can find one here, along with a seed source. Hoover your mouse over the thumbnail and you can see a larger photo. I like radishes, and until a couple of years ago all I knew were the small, vibrant red, pungent, crunchy balls of flavor. Once korean cuisines entered the trendy foodie scene, the Daikon radish appeared. These large, white cylindrical shaped roots challenged what I knew and thought a radish was. Once the fascination starts, the researcher and historian kicks in, and all of sudden I have a new subject matter to explore, which makes me happy. Now, as an advocate for heirloom vegetables and pure food, it gives me great pleasure to find different varieties of vegetables as content for what I do. This year, Rat Tail Radishes will be in my garden. When I saw the photos and description of this edible seed pod, I felt a deja vu, which is always a plus for me. I found the above an interesting read about the Rat Radish. Again, here's the link. All root varieties of radishes produce edible seeds pods, the unique aspect fo the Rat Tail variety is they are grown for their edible seed pods, not for their root. The plants grow up to 5 feet tall, produce delicate flowers which I've seen described ad edible also. Harvest the pods when small, up to 4 inches in length, they can become tough when they get large from what I've read. They attract pollinators, always a plus, and the young leaves are also edible, which makes sence Since they are members of the Brassicaceae family, otherwise know as the mustards, or cabbage family. You can search for Madras seeds or Rat Tail Radish if you want to do your own research. And finally, I love the name. It adds to the quirky nature of heirloom vegetables. Seed catalogues came early this year, which was a nice surprise. I like the printed catalogs. They're like story books to me. As I sit and read, my mind fills with wonder. I'm taken to a world filled with color, texture and taste. Thoughts of perfect rows, sun drenched days where pollinators play all day inspire me to order a spectrum of delights for my soul. I like catalogs because I chose what I want to grow. I know and trust the source, and I support small, independent businesses that have passion for seed collecting. And, it's an action against GMOs. I know I'll be ordering some tomato and herbs from them. Next, it's Baker Creek Heirloom Seeds, the folks who produce the National Heirloom Expo in Santa Rosa, CA. If you want variety, here it is. After being a vendor at the expo in 2012, I recognize some of the staff in the photos in the catalogue. I know they are authentic since I met some of them. This endeared me even more to Baker Creek. I know some melons will be coming my way from this catalogue that intrigued me from the melon display at the expo last year. See how that works. Fedco Seeds is a seed cooperative in Maine. You can join as a member for $100, and support this wonderful group of dedicated seed collectors. They have a wide selection of seeds, onion sets and seed potatoes known as Moose Tubers. It was Fedco that I found the Mark Twain tomato, and I'm happy to say they have the seed again this year. I will be ordering some Moose Tubers, along with some other sensual delights. They are the catalogues that came in the mail for this growing season. I have others that I picked up in my travels last year, but it's that tradition of seed catalogs in the mail that I feel is part of being an heirloom gardener. Don't get me wrong, I will order online too. Nothing will stop me from varieties that I must have. Remember I drove to Tennessee for Mark Twain tomato plants. There are other sources here to peruse. Last year I tried to do too many varieties in a compressed gardening schedule. Don't try that. This year, back to some basics, some old stand bys, some new choices, and perhaps a volunteer or two will show up. After all, the word's out that my garden is my inspiration, no telling who, or what will show up to model. ... and you get 2013 in lottery parlance. Happy New Year! 2012 was quite a year here at Vanishingfeast.com. The travelling I did in 2012 to find my voice, and to build an audience, opened up so many possibilities. I'm overwhelmed really. The future looks good. For example, I have my first book signing on January 31, 2013. It will be at a local library. I will give a talk before the signing, and the subject will be pure seeds, and their value in the heirloom gardening and food movement. More details to come about this. Now that I have one lined up, I can pitch the concept to other libraries or community groups. I state on the back cover of my book that the book is available for fund raising. Self-publishing offers me the opportunity to buy quantities of books at a wholesale price. For a fund-raising event the book gets marked up, the organization gets a percentage of the profit, and so do I. I'm trying this out as a model for a socially responsible business for the some of the products I create. Along the same line, I'll be an author at a Meet Our Authors event in April 2013, which is a book show of local authors. I have an interview this month, January 2013, with Matthew Dillon, the director of www.seedmatters.org, a new initiative funded by the Clif Bar Family Foundation. Check out their website, specifically the Community Seed Tool Kits. I'm working on my next book. It will be similar to Future Tomatoes. It will be a picture book with stories, quotes or references about sunflowers. I hope to have it ready for the 3rd Annual Heirloom Expo, September 10-13, 2013 in Santa Rosa, CA. I will be back there as a vendor. I'm going to push my t-shirt awareness program Tasty T-shirt Tales this year. Since the goal is to add new varieties to the t-shirt catalogue on the Spring Equinox, that will be a goal for me to launch a bigger push on this. I hope to get to Italy to explore some of the interesting possibilities offered up at Salone del Gusto Terra Madre. I'm waiting on my dual citizenship with Italy. Once I get that confirmation, I can work out the details of what I have in mind. Don't be surprised if you see culinary tours pop into the mix here. I'm also going to get more aggressive with marketing my photography. You can see some of my work here, they are photos from my trip to Italy. These are for viewing now, but I will set up a store this year where you could order directly from bayphoto.com. They offer a wide range of mounting services, and I'm impressed with their quality. And finally, there's the possible new tomato variety that I'm growing out. That's what I see sitting here on New Year's Day. I'll be doing some behind the scenes work. The blog will be moving to a different hosting company, and I will continue to build my audience using search engine optimization. Social media will play a part, but since my audience is information seekers who are looking for benefits, not features, search engines is the way for me to go. Social media tools are great for trends, breaking news, and focus groups to see what kind of information people seek, however for now, I don't see it as a major part of building my audience. Accidents happen in the life, and when your garden is your life, accidents happen there too. For example, mixing up the Aunt Ruby's German Greens with the Pineapples, cutting the main stem of a plant and not the branch, and stepping on a tray of seedlings. Just a few select examples of my accidents. There's another kind of accident, which I'm not really sure it's called, but here's what happened. A few years ago, I honestly can't say how many, but it was more than six, I grew an Orange Oxheart tomato plant, and Cherokee Purple tomato plant. Two very distinct tomatoes in color, shape and size. One is a large oxheart shape, with a deep, rich orange color, and the other, a wide beefsteak variety with Joan Crawford-like shoulders that tend to stay green while the rest of the tomato, is a deep dusky, earthy red. This odd-looking tomato formed on the Cherokee Purple plant that year, which looked like a oxheart on the left, and beefsteak on the right, I thought to myself, how about that. It formed late in the season, just about mid September, and here in my part of New Jersey, tomatoes in an open field will ripen until mid October. I live in a grove of oak trees, and when I grew these plants, I was barely getting six hours of sunlight a day during the summer. As the calendar moved on to mid October, the temperature was dropping, and the sunlight was receding. The tomato wasn't ripening, the growing season was ending, so I though I'd try an old trick we used when I was growing up. I picked the tomato, wrapped it in tissue, and put it in the dark. We did that every growing season with the tomatoes that were left on the vine, and usually had tomatoes until Thanksgiving. I placed the seed in an envelope in a drawer in my kitchen table. The drawer sticks a little,which means I don't used too often, and because of that, I thought I would remember that they were there. Of course, I did forget, until this spring, when I was frantically looking for something. I looked at the drawer, gave the handle a hard yank, the drawer broke open, and out popped the seeds, and but not what I was looking for. To this day I have no idea what I was looking for. As any storyteller will tell you, you either breathe life into your story, or you become reality TV. I decided to breathe. I saw the envelope, which by this point had seeds melded to it, and I decided to give it a go. A germination test happened with six seeds. I folded them into a soaked paper towel, placed the paper towel into a ziplock bag, and placed the bag by my furnace. In a week I had two seeds sprout, and another seed sprouted three days later. Since I had some germination, I worked with the remaining nine. Three plants made it to the garden, and I got one fully ripe tomato. It was the only tomato that I got this without some kind of rot on it this year. As you can see it's the shape of a small oxheart. The color however, is not the distinct color of the Orange Oxheart. The seed bearing tomato came off a Cherokee Purple plant. It's not the color of a Cherokee Purple either. It had a lot of seeds, which is indicative of a Cherokee Purple. The Orange Oxheart is known for a small amount of seeds. The germination rate of the seeds from this tomato was 100%. I'm growing nine plants inside this winter to see if they will bear fruit. I honestly don't know what I'm dealing with here, but I'm going to find out. I'm pleased to have Anea Botton, founder of Valley Girls Foodstuffs as a guest blogger today. Welcome, Anea! I met Anea at The 2nd Annual National Heirloom Festival where we both were vendors. I loved her red glasses, her brand image, and once I got to know her and the folks from Valley Girls Foodstuffs, I was very impressed with them and their mission. Since the expos, a lot of great things are happening for them, and I'm sure there will be more updates as they grow. I thought that a personal account of why an entrepreneur would choose to build a local business with a social purpose would be a good compliment to the recent three-part series about Lavazza, an international company working with a social purpose on a global scale. Anea was kind enough to agree to my request to write this post, and here is what Anea has to say, in her own words. Sometimes we do things because we feel called to them. Sometimes we do things because we just plain like doing them. And sometimes we do things because we can’t imagine NOT doing them. Valley Girls Foodstuffs has a little of all of those things bundled up in its origin. Since 2009 I have volunteered at the Valley of the Moon Teen Center, part of a non-profit in Sonoma that offers life skills programming. I’ve been a business owner since 2008 in this small town where I live and grew up when I opened my own insurance agency. In 2009, I wanted to be more involved in my community somehow, and I fell into cooking dinner once a week to a mostly Hispanic population of teens at the teen center. The mother of a toddler, I didn’t have much experience being around teens, and the Hispanic teens at this location brought with them the requisite practiced bravado and unwitting innocence that I remembered from my own days as a teenager. But this group had a particular air of something else I couldn’t put a finger on. And I didn’t realize what it was until I’d spent some time being around the kids. When you see people who live in conditions you yourself have never experienced, it’s hard to know what, exactly, you are dealing with. There were so many stories, big and small things, and they began to coalesce into an understanding of what it means for kids to be “at risk.” It’s so many things - financial hardship, family issues, lack of education. It’s one or a combination of those things. And for the harder hit, the ones with parents who are missing for one reason or another, the deck seems to be stacked exponentially against them. I’m not a social worker and I have no background in social reform. I only know the things I’ve seen working with and around these kids. Some of the kids come from really large families with 6 or 8 kids living in 3 bedroom houses, loving homes of limited means. These kids have a strong sense of family and tend to stay out of trouble, do well in school, and not affiliate with a gang. But they have little money and few skills. They go to the teen center after school mostly to partake in the life skills programs offered there, to socialize and to eat food they don’t have to share with siblings. More kids have bigger problems. I saw a 16-year old boy (who had 2 jobs while going to high school, with a live-in girlfriend and a baby girl at home) get beat up in front of the teen center one afternoon. My heart skipped several beats and I froze while the director of the teen center, a woman, chased away his assailants and picked him and his glasses up off the ground in front of the teen center. The director told me later it was all over his “color.” I thought she meant his skin; he looked no different than any of the other kids. She had to explain she meant gang colors. And there was the time I overheard a young girl crying, whispering about how the night before her mother and aunt had dragged her by her hair down the street where she lived because of something she’d done. A few weeks later I learned she was in foster care in another town, trying to figure out how to get back to Sonoma to see her boyfriend. And there was the boy who had to pick up his dad from bars at night, the father drunk and railing in Spanish, while his son held him up and walked him home. And the girl whose dad was in prison and whose mother had been through a series of boyfriends, men who it was rumored had touched her in ways that we call inappropriate. None of these kids are angels; they often use foul language and posture in ways that looked ridiculous to me. But they are kids and it makes me wonder what my life would be had I been exposed to even a fraction of what they deal with daily. I look at many of the kids at the teen center and I know I can never fully understand their situation. I’m not going to change their world and I probably won’t change many of their lives in a huge way. But I can still do something, and that something is Valley Girls Foodstuffs. While it is a new and small business, it attempts to address a piece of the at-risk culture in my hometown by employing some of the kids I met while volunteering at the teen center. I teach them preserving skills like canning, drying and fermenting as well as baking. We use surplus and “less than perfect” produce that would normally be passed over by more aesthetically inclined shoppers, but which is perfect for preservation. I am not making enough money yet to cover all of our costs, but I didn’t expect to, not so soon. And while we cook, we talk about food system issues, we talk about business, we talk about our lives. One of the things I have seen in founding a food business with a social purpose is that I must carefully consider each decision and weigh it not only on its merits from a business perspective but also on its merits within a food and social equity context. I am not building the next cell phone app nor creating a singular food product that fills a niche market. The kids are learning usable skills, they create a plethora of delicious products from produce people might otherwise let go to waste and they get paid for the work they do. They are learning how to run a for-profit business when most people might go the non-profit route because I believe it’s important to teach kids the benefits of working for their money so they don’t have to live in a manner that leaves them beholden to anyone. Sometimes we do things because we feel called to them. Sometimes we do things because we just plain like doing them. And now that Valley Girls Foodstuffs is up and running, I just couldn’t imagine NOT doing it. In the first two parts of this series, I wrote about the choices that business owners make in running their business. 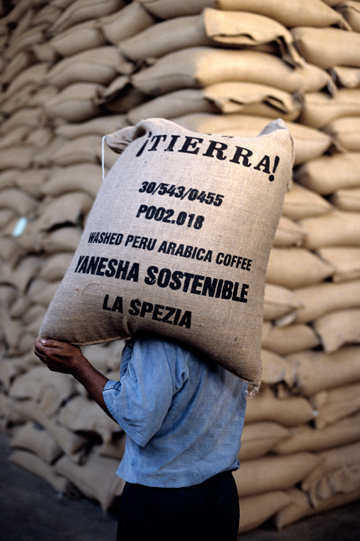 In part 1, I contrasted the choice of greed versus social responsibility, in part 2, I wrote about ¡TIERRA!, a project by Lavazza coffee to create sustainable and autonomous coffee growing communities in six countries on three continents, and today, I'm going to write about the roundtable I attended that inspired this series. The roundtable, Partners for Sustainability, Together for a Sustainable Future at Salone del Gusto Terra Madre 2012. The roundtable was a discussion between Daniel R. Katz, founder and board chair of Rainforest Alliance, Ana Paula Tavares, executive vice president of Rainforest Alliance, Carlo Petrini, founder and chairman of SlowFood, and Giuseppe Lavazza, vice president of Lavazza. Carlo Petrini spoke first. I have been familiar with Carlo Petrini since I discovered Slow Food back in the late '90s. This roundtable was the first time I hear him talk. He's a very smart man, committed to his cause, and he focused on what the true meaning of sustainable. An interesting point he made was about how something goes from being a viable idea to something so big, that is just talk. When it gets to this point, the idea, no matter what it is, is not sustainable. He followed that with a warning that with the finite resources we have on the planet, mass consumption, is not an option. Next to talk were Daniel R. Katz and Ana Paula Tavares of the Rainforest Alliance. I have to admit, I didn't know much about this nongovernmental organization. I knew that their mission was to stop the wanton destruction of rainforests, but that was it. I didn't know about their certification program, which from the brief description I heard, is quite impressive. First though, something that Daniel Katz said struck me as someone who is authentic in his purpose, this is paraphrase, that he'd rather build a solution than a bridge because bridges can be burned. To me that indicates long-term thinking with the focus on the mission, not the personalities involved. Also, he mentioned that the Rainforest Alliance's larger audiences are the United States and the United Kingdom, not Europe. Hopefully, that will change since they and now working with Slow Food International. Back to the Rainforest Alliance's certification program. Ana Paula Tavares spoke after Daniel, and one of the topics she touched was the certification program. She said that there were different specific requirements for the different types of products they certify, but a few general requirements include access to healthcare, high quality production standards, schools on the land where the producing community is located, the right of the workers to organize, and that the minum age for work is 15 years old. To me, this defines what Daniel Katz said about building a solution, and not a bridge. Having a stringent requirements is a solution for all the people involved. Giuseppe Lavazza spoke last. As a student of gesture, I'm constantly observing people. It fascinates me, and intuitively, it helps me read people. Lavazza's gesture was the most interesting. During the roundtable, whie the others were talking, Lavazza sat there in listening intently, while pondering what was being discussed. When it came to his turn to speak, he spoke with pride about the history of Lavazza and their commitment to social responsibility. His warm smile, his bright eyes and animated gesture, reinforced his genuine commitment to ¡TIERRA!. When some challenges were presented to him about the future direction of sustainability, especially in Africa, he sat listening intently again, and I'm convinced he took these challenges to heart. Time will tell, and so will social media. In my previous post, I contrasted the sustainable and socially responsible choice that Luiggi Lavazza made in 1935 to change his business vision, with the choice of greed that some American corporations indicated they will make in 2014 when a new health care law goes into effect. The Lavazza Group has always been committed to observing all legislation applicable to the various business units, in the firm belief that the way in which business is conducted is just as important as the profits achieved and that nobody should operate under the false assumption that business targets are more important than legal and ethical standards. ¡TIERRA! is a project that demonstrates the Lavazza Foundation's commitment to a sustainable and socially responsible business model. The project started in 2002 and involves six coffee growing communities in Honduras, Peru, Colombia, India, Brazil and Tanzania. The project is focused on three key initiatives, the quality of the product sold to consumers. 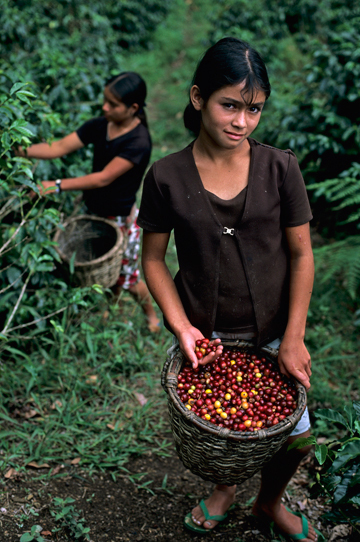 the living conditions in countries where the coffee is produced, and environmental protection. Logic tells me these intitavies are smart, long-term benefits to all, and not short-term benefits for a few. The success of this project is demonstrated by the fact that in 2009, three communities in Peru, Honduras and Colombia are now autonomous. Lavazza ¡Tierra!, is the product that is the result of this project. 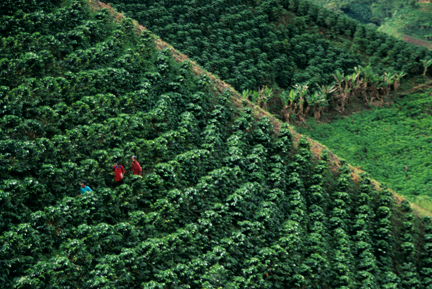 It is a coffee that is 100% Arabica that is produced fully from sustainable farming. It's certified by the Rainforest Alliance, an non-governmental organization that I will write more about next week. They are an excellent organization, with rigid standards required for their certification. The certification has been received for the coffee produced by the Peru, Honduras and Colombia communities, and is being pursued for the India, Brazil and Tanzania communities. The coffee has a beautiful color, an enticing aroma, and bold, deep flavor without any burnt or acidic notes in the either the flavor or finish. I like it. A lot. When I first saw the Good Coffee, Good Karma tagline, the skeptic in me came out. After this roundtable though, I'm a firm believer that this tag line is apt. Let's a take a look at the Tanzania project as one example that kicked the skeptic to the curb. The main phases to achieve independence will have to be carried out in Tanzania as well: improving the living conditions, social development and economic growth of farming communities, improving the liveability of the territory, developing high-quality productions that are increasingly ecological and profitable, thanks to new agricultural techniques and production tools, aimed at greater competitiveness and independence. In detail, the new ¡Tierra! phase in Tanzania saw the involvement of 750 coffee-growers and their families, for a total of about 3,750 people. The work carried out benefited from the ongoing collaboration of international and local partners, including Kirua West Cooperative Union (KWCU), Kirua Children Association (KChA), Kilimanjaro Native Cooperative Union (KNCU), Tanzania Coffee Research Institute (TaCRI), Tanzania Coffee Board (TCB), and City Coffee Ltd. The ¡Tierra! 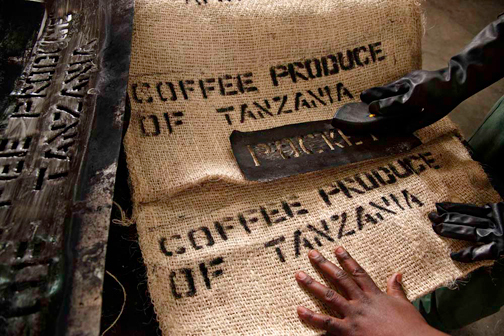 project in Tanzania is aimed at providing constant training to coffee-growers, guaranteeing the quality of their product and improving economic and social sustainability, thus enabling them to access the international market and, in the near future, also to sell their coffee independently and in a competitive way. There's nothing more that I can add to that except thank you to Lavazza for doing this, and to encourage you to look for all Lavazza products where you shop. You can go here to find ¡TIERRA!, scroll down to the fifth row. Amazon.com also carries it through the same seller as the previous link. Steve Mc Curry is an excellent photographer, and storyteller whose work is world-renowned. He's taken the journey with ¡TIERRA! since the start, and here are some of his photographs that Lavazza provided at the roundtable. Click on a thumbnail, and the gallery will open on separate page where you can click through all the images. Next week, I will write about the participants in the roundtale, Daniel R. Katz, founder and board chair of Rainforest Alliance, Ana Paula Tavares, executive vice president of Rainforest Alliance, Carlo Petrini, founder and chairman of SlowFood, and Giuseppe Lavazza, vice president of Lavazza, and what was discussed. It was during a trip to South America in 1935 when Luigi Lavazza expressed his dismay at the destruction of whole batches of unsold coffee — an experience that left its mark on him, and changed his business vision. An examination of shared pathways and projects to guarantee sustainable development. A debate on the concrete ways of doing business, reconciling attention to products with protecting our resources, starting with the experience of the Rainforest Alliance, the international NGO that has been collaborating with Lavazza on the ¡Tierra! project for ten years. It was a lively and informative discussion, and I learned a lot in 90 minutes. I was impressed by the choice of Lavazza to be socially responsible. It shows that there is a choice about a business is run, and sets a good example. Lavazza's choice provides a good contrast to the choice that some businesses are making here in America. In America, the 2012 presidential election is over. Americans chose to reelect Barack Obama, and with that choice, they endorsed his health care law. Health care in America is a mess complicated by greed and politics. There are some business owners who have made it clear that because of this law requiring them to provide health care to workers who work 30 hours a week or more, will have their hours cut so the business won't have to provide them health care. This law applies to businesses with 50 or more employees, and goes in effect in 2014. Considering the potential public health problem this creates, food handlers without health insurance, not to mention the lack of responsibility to the well being of the employees who help the business make money, and to consumers who drive these companies business, it a clear choice of greed over social responsibility. A business in and of itself can't make its own decisions or choices. The business owner, or owners, make the choices that define a business its business practices. Lavazza's choice, sustainable development, along with collaborating with an international NGO that protects the rainforest, and all its inhabitants while maintaining a successful business, is socially responsible. The restaurant chains choice of cutting hours to deny health care is greed. Now, you might be wondering, how does this play into a blog about heirloom varieties of plants, the threat they face with extinction and storytelling. A major motivation for me is encouraging people who heirloom garden to look at their gardening, and the knowledge that goes with it as a family heirloom that passes to future generations. Luigi Lavazza's family heirloom, his coffee business and his business vision, is good fit for the motivation mentioned above. His quote resonates deeply within me, and I'm quite impressed with the ¡TIERRA! project. It amplifies the core message in that quote, and it will demonstrate the clear difference in the choices, social responsibility verses greed. Next week, in part two of this series, I will tell you about the ¡TIERRA! 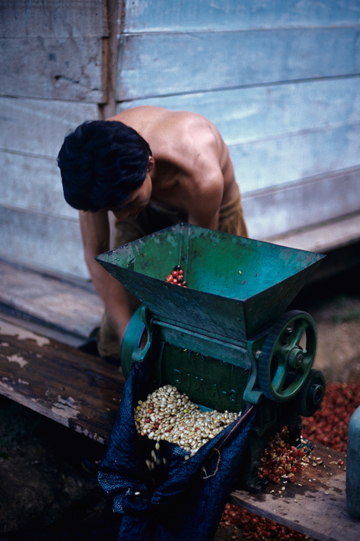 project, and share some wonderful photographs by Steve McCurry, provided by Lavazza Part three the following week will focus on the roundtable. A lot of what I write about here is about looking at your life as a story you write everyday. One example I use is to look at the challenges that arise in your life as plot twists, since that's where the magic happens. They provide that rich and unexpected content that makes your story truly your own. These challenges add depth to any story, and they open up story lines and character development better than anything planned. It's a great concept, and this unexpected delay in Italy for a week is exactly the type of opportunity I always refer to. Be careful what you wish for could apply here. It will take a long to process all of this, and to pay for it, and in the week that I've been back, I have had little time to figure any of it out. Salone del Gusto Terra Madre (SGTM) was an awe-inspiring experience. The scale of this event was vast, the commitment demonstrated by Slow Food International to their mission was impressive, and that impressive commitment was on display by the Slow Food Presidiums, food communities and producers who were exhibitors and vendors. I was truly overwhelmed and inspired. I have a lot of exciting and interesting stories to share with you going forward. I highly recommend this event. Turin, the host city is a wonderful, and the experience that I had staying at the foot a UNESCO World Heritage site was quite frankly, unbelievable. I'm a very lucid dreamer, and there was a plaza in this enclave that I have dreamt about over the course of my life. There was also an intersection in Turin that I've dreamt about. To see these two places so randomly on this trip opened this story up to level that a true storyteller could only dream about. Literally. Between these events, the awe inspiring SGTM, and the unexpected 7 day delay in Rome, it makes sense why I feel so stunned. Stay tuned, and you will see how being stunned is processed into inspiration. As some of you know, I'm stranded in Italy for a week due to the storm named Sandy. I was fortunate to land in the Ostia area of Rome, and I found a great hotel for five of the seven days. I had to check out this morning, and I have 3.5 hours before I can check into the next hotel. This is my ninth day in Italy, and only the third it hasn't rained. Once again, I'm very fortunate to have a beautiful day to sit outside for a few hours, especially along the coast of the Tyreannan sea. The plaza is slowly waking up. Shop keepers are washing their windows, cafe workers are opening their umbrellas, and the local feral cat is walking around looking for his morning meal. Some shops have bowls for him outside their front doors. Deliveries are being made, the morning paper being hawked by guys trying to make a buck, and the local dogs are taking their caretakers out for a morning stroll. It truly is a beautiful day. I am at the Plaza Anzo Marcio. As I sit here watching the day unfold, I'm on as much display as the show going on in front of me. I don't look like a local. The style, cut and palate of my clothes are different. I have a suitcase, a camera bag, a laptop satchel, and an umbrella. I'm also typing on a iPad. So, basically I'm either a well-to-do homeless person, or a tourist. It's the elder folks that I get the stare from, I'm talking THE stare, not just a quick glance of curiosity. I've noticed that a lot of this trip. The plaza is wide, with palm trees and apartments buildings ringing the perimeter. In my brief visit, kids here seem much more behaved than the kids in the states. I have to wonder if the lack of high fructose corn syrup and processed foods has something to do it with. Or, is it the general difference in lifestyle between Italy and the United States. Perhaps, it's a combination of both. The Italians smoke a lot. I feel that when I get back to the states, I will be addicted from all the second-hand smoke. I think that's another conspicuous sign that I'm not local. I'm not smoking. Also, no sunglasses. I tried to get a pair of prescription sunglasses before this trip, that however didn't happen. Next time. A short time after I sat down, I can see the plaza is filling up. Parents will strollers, others heading to the food markets or stores with their rolling shopping carts in hand, and people in general taking a leisurely stroll. I have yet to see an Italian in a rush. Yesterday while sitting at cafe by the Coliseum, it started to rain. I heard the owner say, "Ah, rain, so what, this is life." Nice philosophy, and one I think I could get used to. One hour down, time to switch vantage points. I move to the opposite side of the plaza. I'm closer to the intersection so to speak. Right in the middle of the action if you will. I'm also more conspicuous here, which is fine. It would be nice to know some the language though to hear what they might be saying. Little dogs are popular around here. While by the Vatican yesterday I did see some larger breeds, but around here, miniature Doberman Pinchers, Dachshunds, and Chihuahuas are very popular. There's a lot of kids playing. When you live in apartment with no yard, the plaza is your playground. The strollers here are much more stylish, and look a lot more secure than what I see in the states, Also, they are strollers, not mini SUVs. A big difference I see between here and Turin is the use of color. I found Turin to be very monochromatic. Here there's bright colors, chartreuse, oranges, and pinks. Lots of bicycles, both here and in Turin. In Turin, I saw a lot of vintage bikes. It fit with the overall feel of the city, or at least in my observation of it. Here they have a more modern style. I think the OCD I was developing with checking my smart phone every few minutes will be cured after this trip. I've been cut off immediate access to the 3G network I have with Sprint iPhone. That's a good thing. I also haven't listened to any my music on this trip. That's been a refreshing change. Sitting here at this plaza, the soundtrack is that of life. People talking, children laughing and playing, the swoosh of bicycles as they breeze by, and the occasional higher octave of a motor scooter swoosh. It's like the bicycle swoosh enhanced by some caffe. The street vendors here are aggressive. I just had one trying to sell me his wares, and it took 3 times of say no to finally get him on his way. I guess all the props I have around me makes me a look like an easy mark. I can't wait to put most of the props away. Semi-conspicuous would be much nicer. Enter a delivery truck. Next, someone on roller blades. More Chihuahuas. Mannequins getting cleaned with what looks like Windex, and a paper towels. Now there's a new twist on a window display. Some very heavy clouds entering the picture, perhaps I should move on. No locals with umbrellas though so perhaps they are just clouds. I've been drenched numerous times on this trip, so now any cloud I see becomes suspect. Now awning being cleaned. It's approaching noon, the kids are being replaced by the youth. Many hugs, and lots of kissing. One truck leaves, another takes it place on cue. People are now reading the paper. The first I've seen in the last two hours. Off to another vantage point for hour three. I'm now at the opposite end of where I started. I'm at the entrance, and its much quieter here. The plaza opens up to the street. There's a Farmica to my right, and Omeopatia is printed on the awning. Farmica is the pharmacy here, and you would never Omeopatia or Homeopathy advertised outside a pharmacy in the states. The clouds have broken up, and the sky is a deep blue. There is no humidity, and the air is crisp and clear. It could be because I have to stay in the shade to write. The pace is still slow as the day moves on. There's a bus. The public transportation system here is very good. Ah, someone in a suit gallops by. Seems he forgot a bag at a cafe. He get the bag, and resumes the slow pace as he walks onto the rest of his day. Someone's drinking from a public fountain. They are all over the place here. This seems to be the slow end of the plaza. An elderly man on a vintage bike, a young man on sleek modern bike. Bot stop at the Farmica. I have yet to see a police officer. Some street cleaner picking up leaves. Ah, someone else with a suitcase. I am not alone. A dog emerges from the wine bar, and refuses to be petted by a stranger. He goes and sits in the sun. He looks comfortable. Oh, now he summoned and marched back to the wine bar. Two very stylish woman walk by. I love Italian style. The elderly man with the vintage from the previous paragraph rides by with two very large bags, one on each side of the handle bars. He's obviously done this before. The aroma of lunch perfumes the air. It's a nice change from cigarette smoke. Ok, the baseball cap sideways just made its appearance, thankfully on a young boy and not an adult. Ok, the aggressive street vendor's back, and it close to the end of the third hour. Off to the new hotel. Checked into the Bella Vista Hotel, and true to its name, it a nice view from my room. A nice way to end the story, and the rest of the day. When in Rome, as they say, do as the Romans do. I'm not sure bergamots and olive salad would be considered a traditional breakfast here in Rome, but this morning, it was mine. You see, I was stranded in Rome with a damp suitcase full of worn clothes, It was damp from being stranded earlier in the cold rain by a train that never came. The day I found out that I would here for another week, it was also raining, and on that day I went for my first search for the elusive laundromat around the corner. I never found it while walking in the pouring rain with an umbrella, a paper map, and a paper shopping bag full of clothes. I took yet another walk in the rain this morning to see if the laundromat was open. It wasn't. I've accepted the fact that it's not going to open, and will do the best with washing what I need out in the sink or shower, and hope that they dry. As I mentioned, it's raining and cool here in the Ostia area of Rome, which doesn't lend itself to anything drying out. Across from where the said laundromat is suppose to be, is a small fruit and vegetable stand. A kilogram of bergamots, which are a unique citrus, an orange that has a yellow skin and flesh and is very fragrant, are 1 euro, or approximately $1.30. That's about $0.65 cents a pound. So, I picked up five of them, along with some tomatoes, and my total cost was 1.31 euro. When I left the stand, I noticed the rain stopped, and I took a walk around to try to find some cheap clothes to hold me over. My suitcase is packed to the gills, and I really don't need any more clothes. I just need some clean ones right now. As in a lot of city neighborhoods street markets take over areas on certain days. Today, I stumbled onto a market that I hadn't seen before. I saw a lot of used clothing being put out and I thought this was an opportune moment in my day. Luck would have it, it was used clothing from the United States, which meant I could look at tags that had sizes on them that I could recognize. A lot of clothes that get donated to charities and nonprofits are sold to companies that ship them to the rest of the world. And here I am in the rest of the world. While strolling through the market, I saw an olive vendor. I made note of the different varieties he had, and once I secured something to wear, I would go back and get some olives. As luck would have it, I found a vendor who spoke fluent english and had some new, Italian made sweaters for sale. And, he had my size, which didn't exist in the used clothing piles. I found a an adequate sweater, paid for it, pissed the vendor off because I only wanted one, and went to get me some olives. I see the olive salad as my best shot at sampling the varieties on hand, and I ask for a kilogram of them. I forgot what the equivalents are of the metric system, don't have wifi on my phone to google, so I asked for one kilogram, which was 6 euros. To my surprise, I have a large quantity of olive salad, approximately 2.2 pounds of it. Had I bought the same olive salad in my neighborhood in New Jersey, it would be double the price. Same thing for the fresh citrus and tomatoes I bought at the fruit and vegetable stand, and the quality wouldn't be as good. I went back to my hotel room,had breakfast before I did some laundry, which comprised of washing clothes off with water, wringing them out, rolling them up in every available towel, and hanging them around a very small space. They will be wet until I wear them and my body heat dries them out. While it may not be the most traditional of Roman breakfasts, the fact that foods were sold by street vendors, tells me they are local and traditional foods to this area. While supermarkets sell connivence, street vendors sell authenticity, and in the end, that's what I want in my food. Well, this trip hasn't turned out as planned. Internet access problems, travel delays, and vicious storm named Sandy has left me stranded in Rome for a week. So, with that said, all the updating that I wanted to do live will now be done this week as review and recollection. I have nothing but time on my hands now, so might as well spend it writing. More soon. A lot more. As it turned out, the Theater of Taste workshop with Fulvio Pierangelini beacme an opportunity to hear him speak from the heart. He did prepare the food on site. The kitchen was off to the side of the theater. It couldn't have been better. Hearing the words, and seeing the emotions of the man behind the plate brought the expereince to a level that exceeded any expectations I had. Everything I've read about Pierangelini and his philosphy about food, endeared me to the man. He cooks from deep within his soul. As he said at the event, there's a transfer of energy when you cook, so it's important to respect where the food came from, and to demonstrate this respect in gesture when cooking. For example, for his Chickpea Puree with Shrimp, he won't allow anyone else to shelf the shrimp. He will do do so he sure the shrimp have been caressed before being placed on the plate. It's obvious from the dish I sampled, that he embodies his own philosphy. As a side note, I'm a big observer of gesture, so to hear this as core principle of philosophy captures my fascination. It was more of a conversation than a talk. At first, he chose to sit on the edge of the stage instead of standing on it. He said he felt more comfortable sitting down and talking to people. I liked that. It's was more informal, and it felt like my family tradition to sit down at the kitchen table while sharing food and conversation. There were many Pierangelini quotes that I loved, but this one in particular, "The more simple the dish, the greater margin of error," stuck out in the context of the gesture and respect he kept referring to. This dish we sampled was shrimp, chickpea puree and olive oil. When you have three basic components to a dish, they must all compliment each other, and each must the highest quality. "It's better to make an excellent Veal Cutlet Milanese, than it is to make a mediocre Chocolate Sole," was another Pierangelini quote. He was saying that technique was more important than trying to invent something that doesn't work. "Sole does not need to be cooked with chocolate," and he's right. There is no respect for the nature of either of those ingredients, and the gesture of combining the two demonstrates a need to invent more than to work with the inherent qualities in sole and chocolate. Below is the dish I sampled. Very simple, and respectful. Pierangelini said he's not much for decoration. He feels it's an unecessary gesture. He wants the ingredients to speak for themselves, and they did in the form of poetry. This dish was sublime. If the finest silk was liquid, it would have the viscosity of this puree. The taste was fresh and pure, enhanced by a nutty undertone. When Pierangelini was asked about how he gets his puree so smooth, he replied that he uses the best chickpeas, and the water they cook in. I'd like to find these chickpeas. The shrimp came from San Remo, and the fisherman who caught them was there. He spoke in a quiet, humble tone about how sweet tasting these shrimp are compared to other shrimp. They swim 600-900 meters below the water surface depending on how hot the air temperature is. I can see why Pierangelini chose him for a supplier. His respect for the shrimp was matched with his quiet and humble gesture when he spoke about them. †he shrimp were a deep red and white, and when sliced, a nice pure white. They were tender, sweet and slight hint of salt, which completed the nutty undertone of the puree. Pierangelini grows his own olives, that should tell you about the quality of this oil. Quite frankly, it was the best olive oil I've ever tasted. There are many artisian olive oil producers at Salone gel Gusto Terra Madre, and I tasted some really fine samples, some will be written about in future posts, none came close to what completed that plate. As someone who studied the fine arts in college, I never had the opportunity to hear any of the masters who influenced me speak. I would rank Peirangelini up with them as major influences on me. I've read a lot about him, and I admire his philosphy about food. To hear him have a conversation with us a group, and to cook his signature dish as well, was a tremendous honor. I thank him, and Slow Food International for allowing me to experience what he means about respect and gesture. Going foreward it will be a large influence on my work. Anyone who travels knows there will always be hiccups along the way. Between briefly losing my iPad, a couple of flight delays, (shout out to the Aliatlia employee who insisted I arrive in Turin with my luggage), and a lack of wifi access, there you have the 24 hours that it took for me to get here. I'm here now, and have found some wifi, so all is good. I did walk the Gardens at La Vernane Reale, the UNESCO World Heritage site where I'm staying, My studio apt., which is very modern, is directlty across the piazza from the castle's entrance. This is the view from my balcony. Today is the opening day of Salone del Gusto Terra Madre, and on my schedule is attending my Theater of Taste event where Fulvio Pierangelini will be creating his famous dish, Chickpea Puree with Shrimp inan amphitheater setting while video cameras capture his craft from all angles. The images will be projected on screens in the theater, and a taste sample, paired some wine will conclude the event. Later, I will be taking a Personal Shopping Tour with a guide from Slow Food International's University ofGastronomic Sciences. We will be touring the producers at the Marketplace from the Umbria region, which is the heel of the boot, hearing them talk about their process, and there will be a tasting at the end, and I recipe booklet supplied. The Reggia di Venaria Reale is an extravagant baroque Royal Palace used as a Savoy residence in the 17th to 18th centuries. Built in the mid-17th century, it's one of the most significant examples of baroque art and architecture in existence and is one of the most beautiful royal residences in Europe. Inside are many beautiful frescoes and original paintings. My studio apartment is located on the perimeter of this complex. The gardens are vast, and I can't wait to stroll through them. The video below will give you sense of their scale. Hopefully, I'll take a gondola ride on one of the ponds in the gardens here, and there's installation of Brian Eno's music that would be a unique experience. I've been a fan of his since his time with Roxy Music. By understanding where our food comes from, how it was produced and by whom, adults and children can learn how to combine pleasure and responsibility in daily choices and appreciate the cultural and social importance of food. As you can see from that quote, Slow Food International is devoted to preservation of biodiversity, and to the education about why it's so important. To that end, take a look the work of their Slow Food Foundation for Biodiversity, their education programs and their University of Gastronomic Sciences. That's an impressive commitment, and too much to try cover in one blog post. Once I get to SGTM, and participate in the demonstration of Slow Food International's commitment, I can provide real-time examples of what they do. There will a large international Marketplace, where Terra Madre producers from around the world will have their products on display. There will be four plazas, three will feature Italian producers, one will feature international producers. There will be a tour for the press, but as I mentioned earlier, I won't be able to attend the pre-ceremony events. I have a tentative personal shopping experience set up, and I hope that does come through. If not, there is so much being offered, that I'm not worried about filling my schedule. The Caffè Al Bicerin has been serving the drink in Torino's Piazza della Consolata since the 18th century, and some authorities believe that the drink was invented there. Others believe that it originated around 1704 in the Caffè Fiorio which still stands on what is now Via Po. The relationship between Turin and chocolate is honored with a yearly chocolate festival, chocolate tours, and a choco pass that is a tasting tour of some of the chocolate shops in the city. There will be so much to see and do, and I welcome you along for the ride. I will updating the blog as much as I can. I anticipate they will be short bursts of information, with more comprehensive posts when I get back. When I started writing this blog, I focused on the varieties of vegetables that have vanished from seed collections. Being an avid gardener,I know the value of biodiversity to the long-term health of the garden, and the environment. I admit, I had a slight disconnect to the larger picture of endangered plants, all the species that rely on them, and what I am doing with this blog and my work. Sometimes the simple and obvious gets lost. Recently though, that has changed. Let me explain how. With my experience of preparing for the heirloom expo, the sunflower emerged as my new logo. After growing sunflowers this year, and being an astute observer of what I grow, the dots got connected about the sunflower's role in the biodiversity food chain. Pollinators, birds, animals, and humans are fed by the sunflower. It's a good symbol of the feast provided by nature. They are beautiful, and now they are the brand image for what I do. While reading a Slow Food International press release about Salone del Gusto Terra Madre, and the work of the Brazilian Licuri Slow Food Presidium, I came across the plight of Lear's Macaw. Lear's Macaw is a wild parrot whose natural habitat is a very small area in Brazil, noted on the map on the left. Lear's Macaw derives 90% of its diet from the Licuri Palm. The other 10% comes from fruits in the area. They've been known to eat corn also, which puts them at odds with farmers. When 90% of your diet comes from one source, and that source is diminished, naturally you're going to seek out other food source. I know I would. Habitat loss is one of the major factors putting pressure on Lear's Macaw. The other is illegal poaching. Some sources cite habitat loss over poaching, some sources cite the opposite. Both are reasons why Lear's Macaws are endangered, and both are not acceptable. The habitat loss is from clear cutting and fires, techniques used to create cattle grazing pastures. This action is a controversial one, it impacts more than Lear's Macaw. I think how heavily these parrots rely on a single food that is being diminished puts this slash and burn practice in proper perspective for the damage that it does. Some steps have been taken to preserve their habitat. Seedlings of the Licuri Palm that try to reclaim the pastures ate either stomped out by grazing, or are eaten as part of the grazing done in these pastures. As with any invasive species or action, tipping the natural balance in an environment has detrimental consequences. A major fire could now wipe the whole palm population out (5), leaving this parrot fatally vulnerable. While that statement is from the year 2000, it's still relevant today. The fact remains that a species of bird relies on one source of food for 90% of its diet. If anything illustrates the title of my blog, Vanishing Feast – An Heirloom Solution, the plight of Lear's Macaw does. The Licuri Palm is an heirloom variety of palm tree, and it provides the solution of the feast needed by Lear's Macaw. There's a couple of valuable lessons here. First, for me, the expansion of my concept beyond seeds and seed collection is warranted. 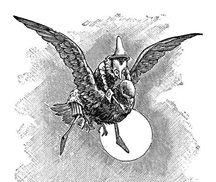 Second, coal miners used to use canaries in coal mines as warnings about dangers of lethal gases. Perhaps, this parrot in a palm tree is a symbol for the danger of habitat destruction and how lethal it can be. For more information about the Licuri Palm take a look at the work of the Brazilian Licuri Slow Food Presidium, a Slow Food International's presidum dedicated to the Licuri Palm, the source of 90% of Lear Macaw's diet. For more information about conservation efforts, here's a good article at The Parrot Society UK. For mor information about Salone del Gusto Terra Madre, here's their website. This will be my first time attending Salone del Gusto Terra Madre. The event offers an array of options for the attendees. It was a real challenge to figure out how I would cover this as a blogger. With all the bookable events, I didn't want to book myself into a corner by scheduling every second of my time. Being press, I needed to leave time for the opportunities that will offer. There will a lot going on, and I want to savor as much of it as I can. For me, that's not scheduling every minute of the day. This year the Terra Madre network will be playing a big role, with six Theater of Taste events organized in collaboration with food communities and chefs from Latin America and North Africa: from Brazil, Beto Pimentel, cook and agronomist, and Roberta Sudbrack, exponent of modern brasileira cuisine; from Venezuela, Carlos Garcia, using local ingredients in haute cuisine; Virgilio Martinez, explaining the biodiversity of Peru; Enrique Olvera from Mexico presenting his evolving cuisine; and Meryem Cherkaoui, interpreting Moroccan tradition with cutting-edge techniques she learned in France’s best kitchens. Closer to home, the story of Italian cuisine will be represented by four Theater of Taste events inspired by a book about Italian chefs, Cronache golose by Marco Bolasco and Marco Trabucco, published by Slow Food Editore. Come sample the historic dishes created by Fulvio Pierangelini, Davide Scabin, Valentino Marcattilii and the Iaccarino family. I like this process of using the best ingredients, making them you own and working with them intuitively. For me, that honors the inherent goodness in nature. I take the same approach when I garden. I find the best, authentic seed sources, create high quality compost to nurture my plants, and then create garden beds in the best location for my plants to grow. When I harvest the fruit or vegetables, they are the highest quality possible because I honored nature's process. I extend this process to how I prepare food. I would've loved to have travelled down the coast of Tuscany to Gambero Rosso while it was open. Alas, that's no more. I am grateful though to have this opportunity to watch one of the top chefs in the world create, and to sample his signature dish. This event is one of many reasons why I'm so excited to attend Salon del Gusto Terra Madre. I will be updating this blog as much as I can while I'm there. I anticipate there will many short posts, with some longer ones mixed in. I will have my iPad, so I'll be able to shoot photos/videos, write and upload all from a single device. I also have an external, solar/light powered keyboard which makes typing more efficient. Please feel free to stop by from 10.25-10.28 to share in this experience with me. When I planned my garden this year, I was looking forward to growing Winter Squash Marmellata, as it's known to the Italians, and Jaune Gros de Paris, as it's known to the French. I was intrigued hat this variety was used for making jam in Italy. In my neck of the woods, pumpkin jam is not very common. I like the flavor of pumpkin, and I tired of tasting pumpkin pie in everything pumpkin around here. My garden didn't do well, and I did get a early, small pumpkin which was rotten. Pumpkin jam, it seemed, at least from this variety, wasn't going to happen this year. One day however, day, good people at The Framed Table asked what flavors we were looking forward to this fall. I volunteered roasted pumpkin marmalade. I knew I could count on my farm stand having Blue Hubbard squash, a solid pie variety, and they do carry some Cheese Pumpkins, so I took a ride over to see what I could find. When I got there, my eyes immediately locked on the Blue Jarrahdale depicted in the photo on the left. Even thought I had no idea what kind of pumpkin it was, my gut told me it was good. I asked if they knew what kind it was, they didn't, so I was off to Google to ask for help. The Blue Jarrahdale is a New Australian heirloom. It's a cross between a Blue Hubbard Squash, and the Cinderella Pumpkin, which it is said was the inspiration for the pumpkin in Cinderella. The Blue Jarrahdales run from 10-20 pounds, they have a very hard exterior, a sweet orange flesh, and a stringless texture. It's a good, manageable size for cooking,great balance of flavor and sweetness, and the texture is superb. It has a hard skin, be careful cutting it, a small seed cavity, and is stringless. I knew I wanted to caramelized it, which would require a sweetener. I've seen coconut sugar around recently, and I did some research about it. The glycemic index is low, which means it sweet without spiking your blood sugar when consumed, and it's packed fulled of nutrients. Livestrong.com provides the nutritional analysis here. First and foremost, food is nutrition. I wanted to create a sweet treat recipe that's packed with nutrients, and with a minimal amount of ingredients. I was able to do that, and the result is the recipe below. Since I wanted to get away from the whole pumpkin pie flavor profile, I went with a flavor combination that's a favorite of mine, orange and bay leaves. Ever since I grew my first bay plant, I've been hooked on fresh bay leaves, or the dried version of the leaves I grow. As it is with most food, there's a world of difference between the fresh and the packaged variety on a store shelf. I find the flavor of bay leaf is a nice compliment to orange. A few notes first, while I was fortunate to find a Blue Jarradale, if you can't find one, I'm sure any pie squash or pie pumpkin will work. If you can find a Blue Hubbard squash, which is fairly common, use that. If you can't find a fresh pumpkin, canned pumpkin should work. The caramelization steps would be different. I used fresh squeezed Valencia oranges. They have a great flavor, but use what you can source easily. Same thing with the sweeter. If coconut sugar is not an option, go with brown sugar. Also, if dried bay leaves are all you have, use them. The butter is finished in a crock pot. For pumpkins and squash, I like the steaming feature that the crock pot offers. The texture is well suited for this slow, moisture-based cooking process. Since the crock pot slowly adds a flavor-induced moisture, a nice rick texture is created for finishing with a blender stick. Coat the cut sides of the pumpkin with the coconut sugar. If the flesh is very firm, and the sugar is not adhering to it, scrap the flesh a little and than apply the sugar. Once the sugar starts absorbing the moisture, it will become tacky. The sugar will stick better. Put in a bowl, or large pot with a lid, cover and let stand overnight on a counter. Place the organe juice into a small bowl, tear the bay leaves and place into the juice. Add the orange rind into the juice/bay leaves mixture. Cover and place in the refrigerator overnight. Next morning, preheat oven to 400 degrees. Line baking sheets with parchment paper. Place orange juice mixture into a crock pot, put the lid and use low setting. Take the sugared pieces of pumpkin out of the bowl or pot, and place on the lined baking sheets. Pour syrup from the bottom of the bowl or pot into the crock pot. Roast the pumpkin for approximately 30 minutes, or until desired level of caramelized is reached. Remove from oven, remove skin from caramelized pieces, they will be very hot, be careful, and place into the crock pot. Let the pumpkin and orange juice mixture cook in crock pot for two hours, occasionally stirring and mashing with the back of a spoon. Finish with blender stick to create a smooth, creamy and rick texture. Process in jars, or plastic bags for freezing. Seed saving note – Pure seed is extremely important to the biodiversity of our planet. GMOs are dangerous, and one way to combat them is to save seeds. Pumpkin and squash seeds are nutrient dense, so there's another good reason to save them. Whether you save them for sowing or food, the process is a simple one. For sowing, remove the seeds, rinse in a strainer under warm running water, and remove any flesh. Dry on a paper towel, set out on a board or screen to dry completely. To save for the next season, place in an envelope, and keep in a cool, dry place until ready to plant. An airtight jar in a refrigerator is an option. Keep in mind though, if you use the refrigerator, and lose power for an extended period of time, the humidity and heat will build up, signalling the seeds to sprout. For roasting, clean the seeds as above. Drain well. Preheat oven to 275 degrees. Spray a cooking a cooking sheet with oil, or line one with foil and spray with oil. Spread the seeds out in single layer, and salt them, or season them as desired. Place in oven, until they turn a light brown. Keep an eye on them, timing will vary from 10 to 20 minutes. Now that this is posted, I'm on my way back to the farm stand to scoop up anymore of these Blue Jarrahdales I can find. They are good keeper, up to a year, from some of the references I've read. With a span like that, who needs a can? The imposing licuri palm is also called the solitary palm of the Brazilian caatinga, the characteristic biome of the northeast of the country, running from northern Minas Gerais to southern Pernambuco, through the states of Bahia, Sergipe and Alagoas. The palm was once an integral part of the landscape and its fruits a common food. Even O Tratado Descritivo do Brasil, published in 1587 by the Portuguese explorer Gabriel Soares de Sousa, contains a description of the flavor and quality of the licuri palm fruits. That date, 1587, is significant. It establishes a baseline of knowledge about this tree in modern history. A lot of exploration of the new world was happening than, and while all of this was new to the Europeans, to the indigenous species of the region, these discoveries were centuries old. In the Piemonte da Diamantina region, in the heart of the Bahian caatinga, the main harvest takes place between January and May. The bunches are cut using a knife or a scythe, collected in a typical basket made from woven lianas called a balaio and transported on the backs of mules or on women’s heads. The women both pick and process the fruit. Sitting at home or in the shade of a tree, they use a stone to break the shells of the small nuts. The nuts are also part of the traditional Easter meal in the region. Since 2005, a cooperative, Coopes, groups 120 different woman gathers from 30 communities to harvest the nuts, and process them into products for sale. An amazing 90% of the Lear’s macaw’s diet comes from the Licuri palm. There can therefore be no confusing the fact that the macaws are totally dependant on this palm and their conservation has to ensure the continuation of the Licuri into the future. Unfortunately however, as the human population in this region has expanded the number of small subsistence farms have increased, further reducing the available natural habitat. Perhaps an even greater concern is the grazing of cattle over large ranches. In many case land is cleared by fire and consequently many Licuri palms are lost. Efforts may be made to protect adult palms by the people clearing the land but this is only because their fruit bunches can be fed to cattle. Think about that, what if your 90% of your diet was from one source and it was disappearing? Scary prospect I would say. As mentioned, the pressure on the licuri plam comes from land being cleared by fire. The fact that one species of life relies on the fruit of this tree for 90% of its diet, should raise the value of this tree above anymore land needed for cattle grazing. This tree was described in 1587 by an explorer of the new world. The nut of this tree provides 9o% of the diet of the Lear's Macaw, and is traditional food of the people who live in this region of Brazil. It's part of their Easter meal, which to the people who are devout, and celebrate Easter, this holiday is most revered. It's demonstrates of the value of biodiversity, that being the dependence on one tree for one species of a bird. Brazilian Licuri Slow Food Presidium is a great example of the role of a Slow Food Presidium. To the local populations, the licuri plam is staple in their lives and traditions, and essential to the survival of Lear's Macaw. To lose the palm and Lear's Macaw would be tragic. With a local Slow Food Presidium working to ensure the survival of the licuri palm, the chances are much better for survival, and to ensure that part of the inherent biodiversity of our planet doesn't disappear. This is one example of the information that will be shared at Salone Del Gusso Terra Madre. Josenaide de Souza Alves, coordinator of the Brazilian Licuri Slow Food Presidium will be there. If I find him, and some licuri nuts at the Marketplace, I'll be sure to let you know.